Dohány Street Synagogue in Budapest is called a large synagogue not in vain. This is the largest Jewish temple in Europe. About 3 thousand people can fit on its area. This is not an accident, because almost 100 thousand inhabitants of the city belong to the Jewish community. The construction of the synagogue took place between 1854 and 1859 under the supervision of the architect Ludwig Förster. In the courtyard of the synagogue there is a Jewish museum, created in the 30s of the 20th century. At the same time, a Temple of Heroes was built, which is dedicated to the memory of the Jewish soldiers killed in the First World War. During the German occupation of 1944, the old synagogue was miraculously not destroyed. All because there was a hospital in its walls. Later, during the blockade of the Jewish quarter, when about 70 thousand people were cut off from the outside world, a cemetery was created right on the territory of the temple garden. After all the sad events of the 20th century, the Dohány Street Synagogue was restored only in the 90s. The architectural style of the structure has been slightly modified, now it is more than before similar to the traditional Jewish buildings. 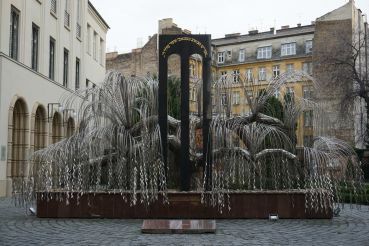 In memory of those killed during the Holocaust, a Weeping Willow memorial was erected in the courtyard of the church. On the metal sheets of the symbolic tree the names of those who should not be remembered are engraved. This original monument is included in the top 10 most extraordinary monuments of the world. Today, the Great Synagogue is not only an important religious center of the Jewish community, but also a popular tourist attraction. 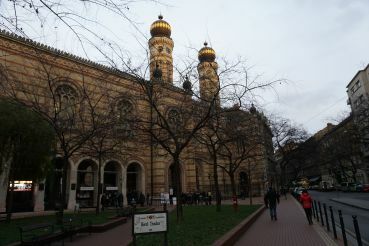 It is convenient to reach the Dohány Street Synagogue by metro. From the stations Deák Ferenc tér or Astoria you need to walk for a few minutes. Trams №47 and №49 run to the bus stops Deak Ferenc ter and Astoria. From March 1 to October 31, the synagogue is open to visitors daily, except Saturday. From Sunday to Thursday – from 10:00 to 18:00, Fridays – until 16:30. From November 1 to February 28 (29), daily, except for Saturday: from Sunday to Thursday – from 10:00 to 16:00, Fridays – from 10:00 to 14:00. Men are allowed to visit the synagogue with a headdress. There is entrance fee.